Q: Why was film preservation and restoration traditionally never taken seriously in India? A: Traditionally in India, films were made predominantly for the purpose of theatrical release. Once released in the at res, films were rarely re-used or showcased on other platforms. Most of these films degraded over time due to poor preservation methods. When television channels began broadcasting these films, a new revenue stream emerged. As broadcasters demanded quality content, content owners began realizing the importance of film restoration. Q: Why are media companies now looking at this with interest? How does preserving and restoring old content offer tangible and intangible benefits to media houses? A: India has an extremely invaluable cinematic heritage. In the early days, the cost of preservation and restoration was very high and the ROI (Return on Investment) never justified these costs. However, this equation has changed in recent times, as the growing number of television and OTT platforms has created a huge demand for legacy content. Recently, the Government of India has also taken up a nationwide initiative of preserving cinematic heritage. Once films are restored and preserved, media enterprises can focus on easily addressing downstream workflows like delivery to OTT platforms, broadcasters and Pay TV providers, thus monetizing these assets. Q: What are some of the challenges – technical and fiscal – when it comes to archiving and restoring of films especially in India? A: Archiving films in their physical form is an extremely expensive proposition, as the prints need to be stored in labs/cold storage facilities. If not stored in proper climatic conditions, the prints begin to deteriorate with the passage of time. Q: Does India have a good pool of preservation and restoration experts who can archive and restore movies? If yes, then please name these entities (government sponsored or private bodies). If no, then please outline the reasons why they do not exist. A: India has a handful of preservation and restoration experts who can archive and restore films. Prime Focus Technologies (PFT) is one of the nation’s oldest restoration houses. It offers Academy® Award winning Lowry Digital technology - one of the ﬁnest tools in the world for Remastering, Up conversion and Restoration. This unique technology helps content owners bring new life to their legacy content by re-purposing it for high resolution viewing across all platforms - VOD, OTT and traditional linear television broadcasting up to 4K-UHD. Q: Please explain in detail the processes involved in the restoration, preservation and archiving of old movies? Are there any standardized approaches or documentation to these processes so that the next set of archivists can follow them easily? A: The process involved in restoration and preservation is quite complex. It starts with inspecting the best available film element. If the film is degraded, it will not wind at the table, which means that the film cannot move to the next stage of cleaning. In such cases, various physical film lab techniques can be applied to the film. The film is evaluated on a film inspection bench. The film is unwound on the bench and issues related to tears, perforation etc. are noted, and if possible, repaired. Once this process is completed, the film is ultrasonically cleaned. This process ensures that the surface dirt and dust are removed and film is ready to proceed for scanning/digitization. During the digitization process, the film is scanned frame by frame at the highest possible quality level. Once the film is digitized, the restoration process can begin. 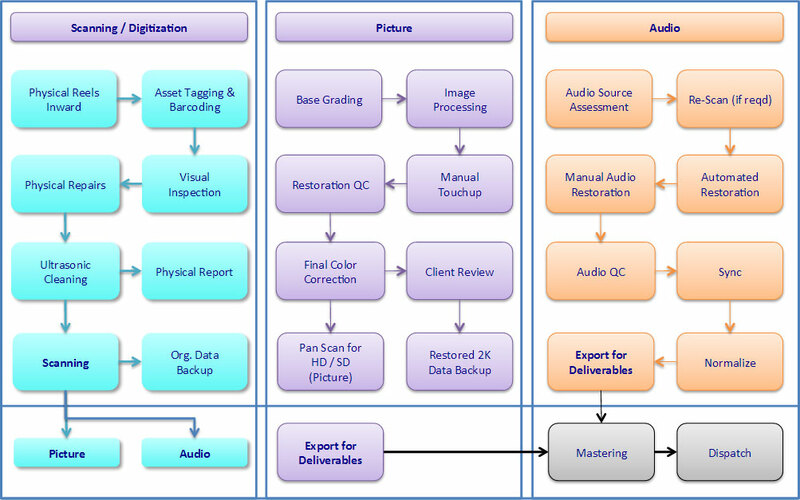 The first step of restoration is to analyze and identify issues present in the film and plan out an estimate for the digital restoration effort. The overall intent is to restore the film to its original quality. A refined image processing pass is applied by highly skilled restoration artists to remove high frequency dirt and scratches. It is critical to set the automated parameters properly, as any aggressive parameter might alter the original look of the film. The image enhancement process is done using our proprietary ‘Lowry Digital’ technology, which yields breathtaking results. This needs to be followed by a frame by frame manual restoration process, where every frame is treated on the basis of issues which remain after auto processing, as well as for film damage, splices and running scratches. After restoration, the process of color grading is conducted in a proper color calibrated environment (generally a theater). The process is completed to the satisfaction of the client/director/DOP (Director of Photography). Q: What are the technologies that are currently used for each of these processes? A: Currently, sprocket-less HDR scanners are used for scanning. Often films are damaged, and require smooth and seamless transportation during the scanning process. Optical pin registration stabilizes the film movement between frames. Several software products are available for restoration today, including Lowry Image processing restoration tools, MTI DRS Nova, Digital Vision Phoenix and Pixel Farm Clean. Each tool has unique characteristics which can solve various restoration issues. When the tools are used in tandem, they can greatly reduce the amount of time spent on film restoration. Q: While image manipulation is easier to achieve, how is the sound enhanced in some of the older movies? What are the technologies used to match and transfer the right sound with the restored movie frames? A: Defects like clicks, hums, buzzing and broadband noise are reduced using state-of-the-art audio restoration systems like CEDAR. Any error in audio/video synchronization is corrected using the Digital Audio Workstation application. Audio is enhanced by experts using equalization and other forms of audio processing in an acoustically treated audio suite which uses extremely large, full range, active monitoring systems. Q: What are the latest developments in scanner technology that enable companies engaged in film restoration to use it optimally for splitting raw scan and post-processing? A: Features like higher 4K resolution, triple flash higher dynamic range sampling (HDR), LED light source for uniform illumination, optical stabilization, infra-red scratch & dust mapping assists, and downstream restoration are available in new scanners. These make it easier to handle fragile films and also help achieve better results in terms of image quality. Additionally, faster scanning speeds are now available, which help reduce costs and increase the amount of film that can be scanned. Q: Please give details of some classic Indian movies that were successfully digitally restored, outlining some challenges that were faced during the process. A: There are numerous marquee titles which have been successfully restored in recent times. These include ‘Mother India’, ‘Raja Harishchandra’, ‘Babruvahana’ and ‘Khandhar’. Every title had its own unique challenges when it came to scanning and digital restoration. For instance, ‘Babruvahana’ (an iconic Kannada movie) had serious issues related to stabilization along with flickers, dirt and warping. All these issues were handled by applying complex processes and frame-by-frame restoration. This year, the film was re-released in the at res, and was thoroughly enjoyed by fans. In the US, we have restored many classic film titles like ‘Raiders of the Lost Ark’, ‘Casablanca’, ‘Rashomon’, ‘The Godfather’, ‘James Bond’ series and the original ‘Star Wars’ series. Q: Has the arrival of digital technology helped in the restoration of movies, now that movies are not stored in analogue platforms? A: Yes, digital technology has certainly given impetus to the restoration of both older and newer movies. There are iconic unreleased movies where we have used our proprietary tool set for image enhancement, and this has yielded fantastic results. A few of our clients had issues with grain matching where different film stocks had been used to film the same sequence, and we have been able to successfully fix these. Q: Besides restoration of films, there seems to be lot of interest around preservation of digital assets. What does this mean and why was its need felt? What lessons can be learnt from analogue restoration and applied to digital preservation system? A: Today digital is the preferred medium for content viewing, and digital workﬂows are used across the M&E (Media & Entertainment) industry. The preservation of digital assets involves storing digital content in a way that facilitates easy access and discoverability. These assets can then be conveniently used for downstream processes like broadcast and distribution whenever needed. As technology advances, legacy hardware, drives, players and software are becoming obsolete. Once digitized, content is available in a future-proof form. Q: What are some of the technological, logistical and organizational measures that production companies have undertaken to safeguard their data after restoring films? A: Today, digital assets are stored in new-age, low cost, reliable storage devices such as LTO tapes. Multiple copies are stored at different locations to ensure effective disaster recovery. Many content owners are also setting up dedicated units to manage their archives and future-proof their content. In several countries, governments have launched initiatives to restore and preserve films, as these are an extremely valuable part of a nation’s cultural heritage.